When it comes to teamwork, it’s hard to beat sled-dogs – four to eight to 15 of them, harnessed together, all pulling in the same direction for the same goal. It’s a CEO’s dream. And it’s Kari Hunyadi’s passion. Kari, of course, is the Challenge Course Manager and Lead Facilitator here at NorthStar Adventure but she is also an experienced and enthusiastic sled-dog trainer. Kari developed our environmental programs and facilitates our group programs and dog-mushing program. A resident of Slatington, where she lives with her team of huskies Kari became interested in mushing while living in northern New York more than 10 years ago. “I grew up with show dogs,” she says. “When I lived in New York, I didn’t ski so I got into the dog-sledding. I started the programs in northern New York for the County 4-H where I worked at the time. She later did a program for the Girl Scouts in Connecticut and when she moved here about a decade ago she put together the program we now use for Girl and Boy Scouts and other youth groups at NorthStar Adventure. She also does programs at other locations, such as schools, nursing homes and similar sites where she can introduce the dogs and give guests a chance to meet them and learn about them. 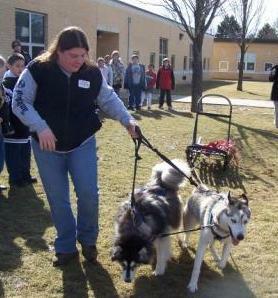 Lead Facilitator and Challenge Course Manager Kari Hyunadi demonstrates dryland mushing at a local elementary school. In addition Kari provides background on what the dogs eat while sledding and what mushers wear during events, the history of major events such as the Iditarod – the annual 1,200 mile long sled-dog race across Alaska that commemorates the sled dog culture in Alaska; what they typically pull today and the vocabulary used by mushers when working with the dogs. There are, however, several key points that she tries to impart to every group. Kari is also one of the Merit Badge Counselors for our Boy Scout programs and has Pennsylvania and Federal Clearances to work with youth. Contact us today to learn more about the dog-mushing and other youth programs at NorthStar Adventure. Call 610-759-2270 or email us at teamwork@northstaradventure.com.